Help Teaching subscribers can assign lessons to their students to review online! Introduction: It may not feel like it, but Earth is moving. Not only is Earth moving, but it is doing so in two main ways: rotating and revolving. Rotation is the spinning of Earth. 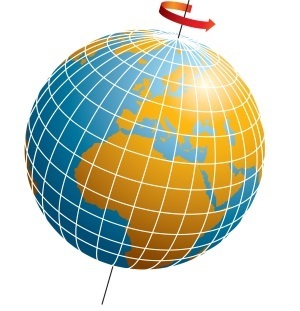 Earth rotates around an imaginary line that runs from its North Pole through the South Pole. This is Earth's axis. Think of a spinning a toy top and how it rotates around its center handle and pointed bottom. The handle and point are like Earth's axis. However, Earth rotates much faster than a toy top! It spins at a rate of about 1,600 kilometers per hour (1,000 miles per hour) at the equator. Earth completes one full rotation in about twenty-four hours. If twenty-four hours sounds familiar, it should! This is the time it takes for one complete day and night cycle, better known as a day. The side of Earth facing the Sun experiences day. The side of Earth facing away from the Sun experiences night. Earth rotates from west to east if you view it looking down at the North Pole. This is why the Sun appears to rise in the east and set in the west. Earth's eastward rotation makes it look like the Sun is moving across the sky. The other planets in our solar system, the Moon, and even the Sun, all rotate too. Although not all at the same rate and direction as Earth rotates. Revolution is the motion of Earth around the Sun. Earth revolves around the point in our solar system that has the most mass. Since the Sun contains the most mass in our solar system, Earth moves around it. All of the planets revolve around the Sun. The Moon even revolves around Earth as Earth revolves around the Sun! The path, or orbit, that Earth traces as it revolves around the Sun is slightly elliptical. A simple way of picturing an ellipse is that of a stretched out circle. It takes Earth about 365.25 days to complete one revolution around the Sun. This is called a year. We adjust for the extra quarter day by adding one day to our calendar every four years. A year with February 29 is known as a leap year. Be careful! The terms rotate and revolve are often confused. As you now know, these words have different meaning when describing the motions of objects in space. Make sure you use them correctly! Try the practice questions to see what you know about Earth's motions.